Do More goals are the simplest and most straightforward goal type, so they're also the most commonly used goal type. Chances are high that whatever you want to beemind, you can do it with a Do More! When should I use a Do More? Use a Do More goal for things you want to do! They're called Do Mores because usually people want to do the thing more often than they already do. Seriously, just about anything works as a Do More, if you enter the data the right way! How should I enter data for a Do More? 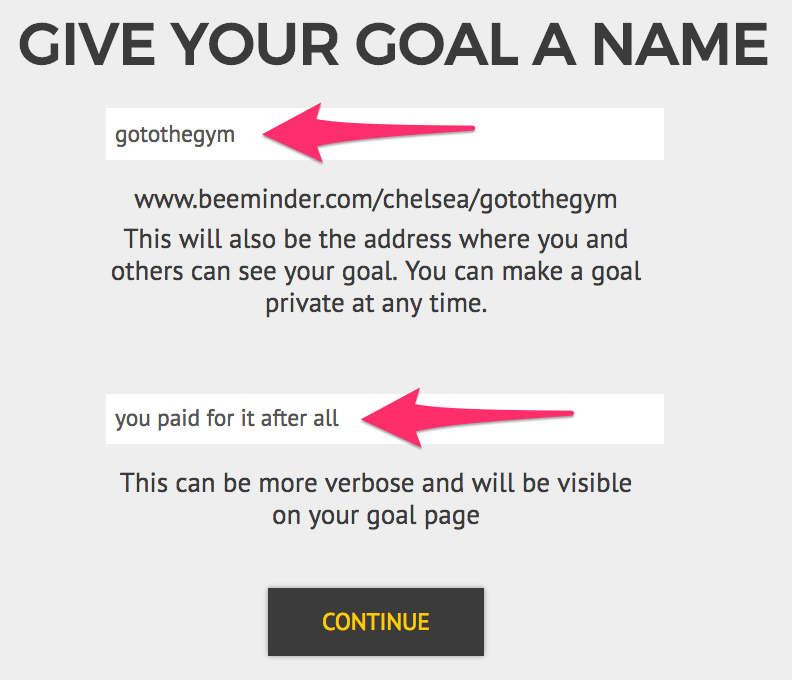 Beeminder needs to know how much you did that day toward your goal. 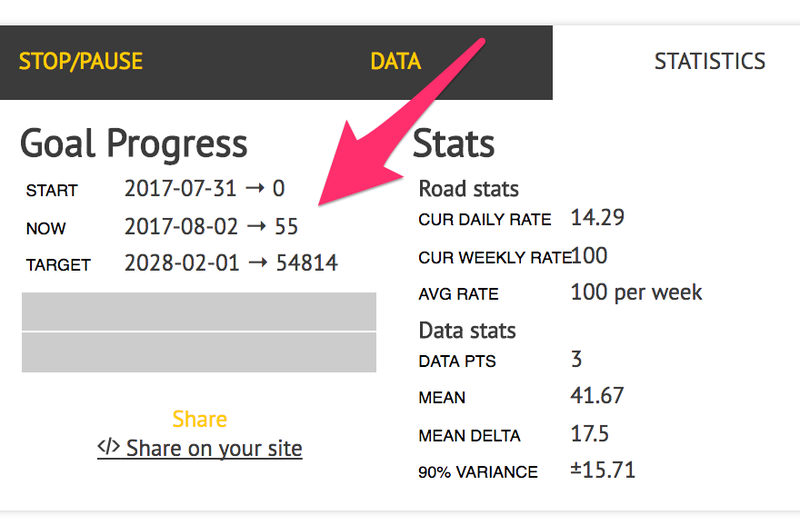 Behind the scenes, it adds up all your datapoints to show you how much you've done since starting the goal. Let's say I have a goal to read more books, and I commit to 100 pages per week. I read 20 pages today, I submit a 20 to my graph. Tomorrow, when I read 30 pages, I'll submit 30 to my graph. The next day, I only read 5, so I submit a 5. And so on. I'm above my road - doing better than my goal rate! Cool. And Beeminder's keeping a running total of all my progress for me, so I know I've read 55 total pages since starting my goal. I'm going on vacation and won't be working on my Do More goal. How can I pause it temporarily? This is super easy to do on a Do More! Using the Take a Break section in the Stop/Pause tab below the graph, first pick the dates that you'll be away, then set the break rate to 0. This will make your road flat at that time, so you don't have to make any progress until it starts sloping up again. 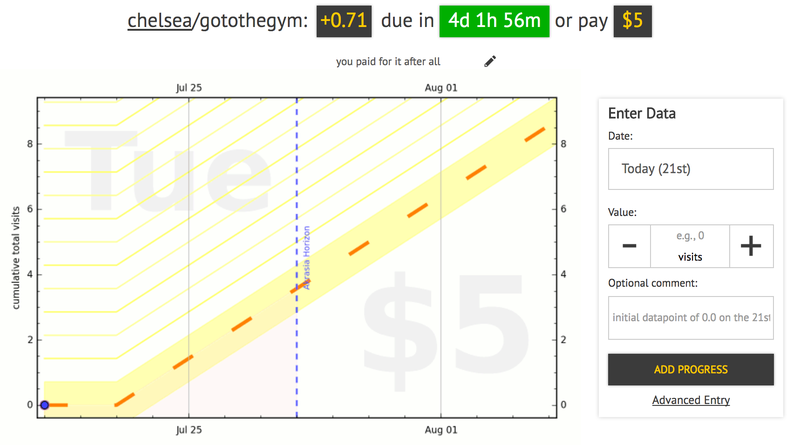 In this example, I want to create a goal to visit the gym at least 4 times per week. Click the + icon to start a new manual entry goal. 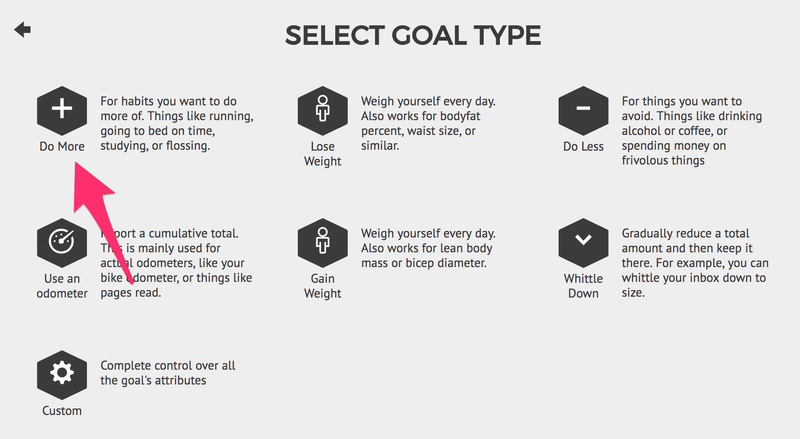 Select Do More as your goal type (because you want to Do More gym visits). Enter the units you want to use and the amount you want to commit to. In this example, I'm aiming to visit my gym 5 times per week. 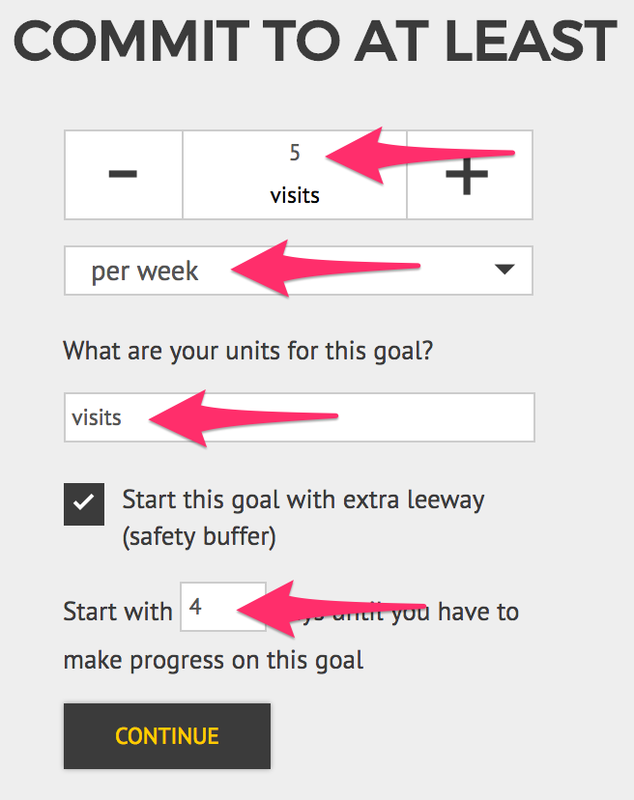 If you want to delay your goal's start a few days (maybe you're traveling this weekend), be sure to tick the "Start this goal with extra leeway" box. Enter the number of days you want to delay and press Continue. And now my goal is ready to go! I'll need to go to the gym and add my first 1 in the next 4 days to avoid paying Beeminder my first $5!